6 Why Should You Listen To James? 8 What Did My Sons Do? Regular readers may remember my recent interview with James McAllister – a talented and hard-working young blogger who is popping up all over the place these days. James offered me a review copy of his latest book “The Young Entrepreneur’s Guide to Business, Finance and Life”. To be honest, seeing it was over 100 pages long, I wondered how I would find the time to read it all – but it was such a riveting read that, although I needed a couple of sessions, I read it “cover to cover”. I’ll address right away the objection that you may feel this book is not for you – if you’re, err, past the first flush of youth, like I am. Readers in the second category, who may be involved in advising their sons or daughters what to do after college really SHOULD read this, because a strong theme of the book is…. But just because the end result (student debt) is prefaced with “I’m going to college / university so (I’m racking up a massive debt)” it’s supposed to be absolutely fine. Well, James and an increasing number of school-leavers are realizing that it’s madness for so many young people to be starting their adult lives with massive student debts. This is all the more crazy when you look at the state of the job market these days. It won’t take long to realize how few graduates are able to get a well-paid job, using the subject they studied, that would (maybe) justify the debt they are left servicing. I heard a radio program about “help for finance problems” the other day and a young couple who HAD been lucky enough to make a start in professional careers, both earning good money, were refused a mortgage because they already had such high levels of student debt. So in effect they were sentenced to paying rent (at about the same cost as the mortgage) for years to come, just because they had followed the party line and emerged from university with their student loans. They could be classed as being in the “lucky” group, because they had at least benefited from their qualifications. Imagine the poor souls stacking super-market shelves while waiting for their dream “media studies” career to materialize. So – in my opinion – anything that shows people how to avoid student debt, or any debt, is a “must read”. Families with college age kids should be aware that there ARE alternatives to university or college, that make complete sense. The alternative that James recommends is starting your own business and he presents very compelling reasons – and practical “how to” steps – for doing this. Of course, this opens up the readership of this book to yet another group of readers – people, with or without qualifications, who just cannot find a job. Again, some sections won’t apply – but much will. Why Should You Listen To James? In a nutshell, listen to James because he’s not preaching theory. He’s DONE it. He’s got the blogs and published books to prove it. Do NOT look at James’s youthful picture and fall into the trap of thinking he’s just a “wanna-be” business-man. That would be a BIG mistake! He has more guts, determination, business sense and entrepreneurial spirit in his little finger than most adults I know have in their whole body. The wisdom he shares is beyond his years. If you read my interview (noted above) you have only scratched the surface of James’s experience. When you read more about his accomplishments to-date in his book, you’ll be amazed – although he’s characteristically modest and dismisses them in just a few paragraphs. His book speaks directly to people his own age, and in language they will understand. However, it teaches valuable lessons to parents too – if they are open-minded enough to listen! Some of what James says might make the average parent quake 🙂 He speaks his mind, but I’m originally a Yorkshire lass and “oop norf” we consider that a virtue. Apologies to those of my readers who have never heard of Yorkshire, but, broadly speaking we prefer people (like James) who tell it how it is, rather than saying what you “want to hear”. With my parent hat on, I was amused by James’s recommended way for students to finance their living costs in the early days of their business. But, hey, it’s what most of them are doing anyway, and far better to be doing it while starting their own business, rather than “finding themselves” or studying ancient languages. Starting a business instead of going to college, as James is suggesting, does go counter to everything that my generation were brought up to aspire to, so as a parent you might find his recommendations rather shocking. 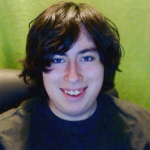 There have been a lot of changes since then. So parents in 2015 need to open their minds to a different way of thinking, and factor in the current economic climate. I come from a long-line of self-employed entrepreneurs and dearly wanted to follow my parents straight into their business. But they insisted I continue my education and get a career. And AT THAT TIME, they were correct to do so. After about 8 years the self-employment bug was still nagging at me, so – equipped with various relevant skills – I went self-employed and have stayed that way with a brief hiccup when I supplemented my income with a part-time job for just a few years. What Did My Sons Do? Old habits die hard and my sons were encouraged down the traditional university route. Funnily enough I remember discussing future family careers with my bank manager and, at the time, I was shocked when he said he would encourage his sons to go into a trade rather than university. What a far-sighted man. I hope his sons took notice of him. As for my sons, neither of them resisted the college route and they emerged with student debts – although nowhere near the level that today’s students are burdened with. I think we’d all have balked at that! My elder son got an excellent job using his qualification, paid off his student debt and earned enough money to build up equity in his own property. Then, he was made redundant at the age of 32 when his well-paid job was out-sourced to cheap overseas labor. At this point he announced that he was burnt out with the stress of his job and commuting / working all hours just to pay travel costs and mortgage. So he took the equity in his suburbia flat, and started up a business in Spain. He’s no millionaire but he’s doing better than we dared expect, and he’s happy with a fairly relaxed lifestyle that he enjoys. So who am I to judge? My younger son studied “Investment, Finance and Risk” and we all watched with pride as he did his work-experience internship with an investment bank, really looking the part with slick suits and shiny shoes. He’s not a millionaire either – but neither is he an unemployed banker. He probably works harder than anyone I know, but his property business is growing and he has the freedom to make his own decisions and live with the consequences. Compared to his peers (and academic superiors – as he’d be the first to admit) he’s way ahead of some who still haven’t got that elusive first step on the career ladder yet. So if your college-aged son or daughter wants to pursue a business venture as an alternative to college, I encourage you to support their decision in whatever way (financially and emotionally) you would have supported the college route. And reading James’s book is an excellent value way to start. He points out that he’s given up a lot to reach his success level, and warns you to expect hard work “An entrepreneur who only works 12 hours a day is slacking”. Writing this after 2am, I can relate to that one! Some of these are terms that will be familiar to many of my readers, but NOT to the average 17 year old, nor even to many parents with the luxury of steady jobs and no concept of being in business. So the book is essential reading (a) before deciding if you’re up to the entrepreneurial life and (b) to get you into a business mindset and (c) for practical advice to get you on the road to success. Although James warns clearly at the outset and several times through the book that starting your own business won’t be easy, he somehow makes it sound easy. My fear is that people without James’s work ethic may read the book and not realize just how exceptional his talents are, and that because of his sheer dedication his achievements are way beyond what many people of any age will achieve. Only someone who has trodden that road already will actually know how many hours of hard graft and research are behind James’s success stories. James does warn that paid traffic is a risk and clearly advises testing, but I fear that the “apparent” ease (LOL) with which he achieved his success might tempt less skilled individuals into borrowing money for paid traffic and advertising in anticipation of profits and, worst case, ending up in just the sort of debt they set out to avoid. It’s impossible to distill all James’s business experiences into just 100 pages, but I think it would be helpful to have seen a few more warnings of the big mistakes an innocent abroad can make. For example a quick explanation on why WordPress.org is recommended rather than WordPress.com. Those three little letters sound so temptingly similar to the unwary, and .com might (incorrectly) be the one newcomers plump for. I missed seeing clickable links in the text, to take me to resources James discussed. Revisiting later, the links ARE clickable, just not “blue”. I’m experienced in using eBooks and still missed that fact. So be sure to follow his links. Some people will say that James has been very ethical not to have included affiliate links, but I would have welcomed them. If people don’t like affiliate links it’s easy enough not to use them. I understand why James doesn’t go for a hard sell and respect him for that, but I would have liked to see him place more emphasis on recommending newcomers to pay for his professional services to do jobs they’ll only do once – for instance he could set them up a really professional blog with all the bells and whistles from day 1. This would free them from a one-off task that they’ll almost certainly do sub-optimally, and leave them to concentrate on tasks they need to do day-to-day. How to fund this? Several methods spring to mind: combined family Christmas / birthday gifts plus many other ways James lists in the book. Although James includes his contact details, my fear is that without an obvious route to him readers will wander off at a tangent and find someone not as honest and competent as James. I’m not qualified to comment on the section on “Investing for Beginners”, because my experience has been the exact opposite of James’s. I found property investing (once I’d got started!) far more straight forward than the stock market, where I lost money, despite being part of a club of very experienced investors and picking shares for their dividends. Other investments recommended to me came with hefty initial charges that (had I gone ahead) would have reduced my sum invested to the extent that it could have taken two years just to get back to where I started. So I’d add a big “Caveat emptor” – the value of your investments can fall as well as rise, and you may not get back what you invested. This is a personal opinion really, but I found James’s views on marriage and children, although factually correct – a little too vehement 🙂 Funnily enough he echoes exactly what Matt always used to say… until he met his soul-mate and married her. She works alongside him in his business and they are “for each other” thick and thin. I would adjust James’s recommendations to a warning to check and double check that any wife or partner is as fully committed to and involved in the business as you are. The right two heads are better than one. I won’t get too soppy, but I truly hope James finds a partner worthy of him, and that when the time is right financially (although it NEVER is LOL) he will have children who bring him as much pleasure as my sons have brought me – far beyond any business successes. They maybe shouldn’t be, but they (and my grandchildren) ARE my reason for living. Not my business. Getting back to the business in hand – I obviously wish James every success with this truly valuable eBook. My few reservations above pale into insignificance compared to the business sense and value that anyone who follows James’s advice will get for a mere $9.99. The book isn’t stuffed with filler, waffle and “pretty pictures”. That’s not James’s style. He tells it like it is and you can take his advice or ignore it. I hope you will take it, and that this book will be widely read. Even if it’s not applicable to someone in your own immediate family, please spread the knowledge that taking on student debt is NOT inevitable. When you look at the sales page, there’s a green “Give as a gift” button in the top right hand side. This book could be the most valuable gift you give your family this year. As James has proved – by example – there are far smarter options available and you owe it to yourself to be open-minded enough to at least make an informed decision. 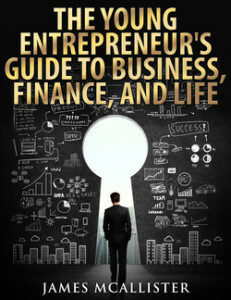 Buy / Give “The Young Entrepreneur’s Guide to Business Finance and Life” now. Reading it, and taking action, could help you avoid many thousands of student debt. I really appreciate the fantastic review of the book that you’ve left here. I had a fantastic time writing this book and consider it to be my best work yet. I’m glad you enjoyd reading it as much as I did writing it. A lot of people make poor choices when it comes to life after high school as well as personal finance. With this book, I hope to give people some additional insight that will factor into those decisions, hopefully saving people from making the life-ruining financial mistakes so many people are making. If anyone has any questions, I’ll be monitoring the comments here and try to respond to them as soon as possible. Glad you like the review. I really enjoyed reading your book and writing it. I’m not sure about the path my sons took – but what’s done is done, and they’ve both ended up self-employed anyway! I hope your book does really well. Awesome n very in depth review Joy. And much congrat James. I know I have a lot to learn from you. Your recent ’email opt-in’ post made a deep impression on me on your deep knowledge and drive. I hv yet to build my list, which I know is a no-no. In the midst of getting further clarity on my niche m focus, but you (James) are definitely someone I look up upon. Thanks Joy for always adding value to your environment. Respect! Glad you liked the review. I have learned a lot from James! I appreciate your kind comment. I agree that you should be building your list, but don’t feel bad about not starting it yet. The reason why I hammer it onto people so much is that most bloggers will make their money through their email list, and it’s also the best tool to get people back onto your website. If you need help getting that set up, feel free to send me an email. I’m glad you enjoyed the review and if you have any questions (about the book or anything else) let me know! First of all, I am a college student. I am also a father and Husband. I spent the first few years in the military and as a result, i got a late start in college. You speak of being debt-free when going to college but how is that even possible for the average person? There are bills to pay like rent, food and electricity. Though there may be some programs available to get a little free school, you generally have to sign up early on and might not have control if your parents missed the deadline. And I doubt the government is picking up your other bills while they pay for school. I am also offended that racking up debt to get an education is a bad idea. Though it does depend on your major, many college degrees pay very well right out of college and though work may be involved to find a job, that is true whether you are a recent PhD or applying at McDonalds. What qualifies the author to write this book? He has a blog? who doesn’t. Anyone with internet access can start a blog. Same goes for writing a book. His book is available on amazon as a kindle book. Anyone can write some crap down on paper and put it on amazon. That doesn’t make him published. That just means he knows how to use a computer. Some people go to college not just for the diploma, but to expand their knowledge and learn new things. Otherwise you are just another ignorant member of society. I’m not saying all people who don’t go to college are ignorant, but if you don’t see the value in continuing your education then you probably are. Take another at the title of the book. See who it’s for? ENTREPRENEURS. People who’s long term goal is NOT to work for somebody else. It doesn’t matter what way you look at it, it makes ZERO sense to borrow somebody else’s money to pay for credentials that you’re never going to use. Nowhere do I say that college is a bad thing for anybody else, although I do say not to go if you’re not going to major in something that will grant you additional employability. If you major in something worthless like liberal arts, psychology, gender studies etc. you’re an idiot. There are no two ways to look at it. If you’re going to borrow SOMEBODY ELSE’S MONEY to pay for something that is not going to help you get a better job than who’s the real ignorant member of society? Anybody in their right mind would agree that working a minimum wage job without debt is a hell of a lot better than working a minimum wage job with debt. Now I wouldn’t normally care about people ruining their lives, but this involves me. College prices are going up while the value of a degree is going down, and less and less people are actually able to pay back the loans they owe. So what happens? The government bails them out using taxpayer money that I, someone who DID NOT screw up and major in something stupid, has to pay for. That’s the problem! The media has done so much to convince students that it’s OK to major in something stupid because college “isn’t all about that money.” Well guess what buddy, if you’re going to take out a life-crippling loan it better be all about the money because you’re gonna have to pay that back one way or another. College is SUPPOSED to be an investment. Those who have the slightest hint of financial literacy will know that an investment is supposed to make you more money than you put into it. Clearly, people do not understand what that means, as we have 1 TRILLION dollars in student loan debt in the U.S and more than half of college graduates are underemployed. That should be clear proof that a college degree doesn’t make one “intelligent.” The ones who majored in something useful are intelligent. The ones who opened their eyes enough not to follow the cultural norm are intelligent. The ones who majored in something stupid are blind idiots and have ruined their financial life at such an early age. I don’t need to prove myself. I have done it and succeeded. Not only do I make more than most college graduates, I wont’ be carrying debt for the next 30 years. If everyone followed my financial advice (along with majoring in something useful) there would be NO financial troubles in this world. I’m glad you’re in college. Please major in something society needs. I don’t want to have to pay to bail you out. First off, what makes you just assume that I am going to school to work for someone else? I am currently a medical resident and plan on being a GP and working for myself. Secondly, where the hell do you get off deciding that certain degrees are worth less? You could possible be one of the most arrogant people I have ever come across and you have little to no life experience. Having a college degree does not make you intelligent nor does writing a book make you a credible source. Additionally, if you feel like rattling off statistics you need to cite your sources (which any successful college student would know) because I know you didn’t do your own research or gather your own data. Lastly, berating people for needing to take out student loans for school is about as helpful as teaching your dog to read because as we all know, at least those of us that are actual well rounded people, attacking people for their choices only makes them defensive. In closing I would like you to know that I find it interesting that you think a psychology degree is useless because about 50% of the teachers and professors that I know have their bachelors in psychology because they have used it as the stepping stone for their masters in teaching; you have insulted the very people we trust to provide our children with an education. So congratulations on that accomplishment! You come into my kitchen buddy you’d better take the heat. The job market is driven purely by supply and demand. If there is no demand for a job, than majoring in that area IS worthless. You and I don’t decide what gives a job value. Society does. Society does not need liberal arts / philosophy/ gender studies majors or any of the other stupid degrees people are majoring in. If the only job available for a degree is to teach it than it’s worthless. I applaud you for going to school for something useful. Most people ARE NOT. You’re making better choices than most college students. Why bother? I could cite all the statistics I want, facts are not going to convince someone that aruges solely on emotion. How much further will it go? Hard to say. It won’t work though. Rich people aren’t stupid. We’ll just leave. Remember who gives society their jobs – it’s not the government, it’s the business owners. There are some brilliant college/university professors, and if I had my way I’d be paying them a heck of a lot more to make that area more competitive. Unfortunately, instead of bettering the school or the education, college/university profits go into programs like advertising or higher executive salaries, as well as building things such as sports facilities that make the school more appealing to young idiots who do not know they’re being played. That’s great. This book is about making money, something I have been very successful at doing. The fact that I am in a better financial situation than 99% of people this book was aimed for makes me more than credible enough to talk about it. I am sure you’ll be very successful as a GP. This book was not aimed for you. This book was written for people like me, who will not only end up making significantly more money, but doing so without becoming a slave to an employer. Have a good one Michael! James has done a great job in answering your points about college courses and I would just like to add a couple of points myself. After leaving school I continued my education with home-study that did NOT involve taking on debt, so I do appreciate the value of continuing education to learn new things. Furthermore I would point out that yes – anyone with a computer can have a blog and put a book on Amazon, but from personal experience, it’s not so easy to make a decent living from it. Have you tried it? You are to be commended for tackling college alongside parenthood and after military service. That must be tough. We just wish to show that there is an alternative approach for those who, wisely in my opinion, prefer to avoid racking up student debt. Joy you really did a fabulous job with your review! personal experiences, as they related to your sons. an absolutely fabulous and extremely informative read! of no nonsense, “tell it like it is”, whether you like it or not type of guy! There’s no sugar coating with him! Which suits me just fine!LOL! And it’s so darn refreshing! Just to be totally upfront! BTW, Joy,until you translated it, I had no idea what you meant by your comment about “oop norf?” I guess it’s one of those says that only a true native would get the reference!LOL! Anyway, thanks for sharing a really nice review! And the best going forward to you as well James! Appreciate your kind comment. Joy definitely did a fantastic job reviewing this book and I am very thankful for her hard work. You’re definitely right about the way I approach things. I was spoon-fed a bunch of feel-good nonsense when I started out and it did nothing but waste my time. The way I see it, if you’re not able to accept things as they are, you’re not going to succeed. If somebody’s going to get upset and quit when things get hard, I’d rather than do it now than after they’ve invested so much time into it. You get places by doing what works, not by being told what you want to hear. Once I learned that, I began applying it to every aspect of my life, and it shows in my business and in this book. Thank you Mark, I appreciate your comment here! Glad you enjoyed the review. I enjoyed reading the book and writing the review. James is so refreshing compared to many (not all!) of the young people today and I am delighted to have been able to welcome him onto my blog. Yes – as Edward commented on my blog the other day…. “We’re supposed to be speaking the same language?” Haha – I have plenty more Yorkshire-isms in my “bag”. This is a really great review ! And very good book! Don’t listen to people who just go out of their way to bash. They only try and put you down because you got successful in an easier way! Stick to what you’re doing. Glad you like the book and the review. Yes there will always be people who dislike another person’s opinion, or way of doing things, and they’re entitled to their way of living. However I do agree with James that’s fine, until other members of society end up picking up the price tag by taxes. I’m from the UK, not the USA, so can’t comment on how it works over there, but over here I personally know of several students who graduated in “odd” subjects, now sitting at home wondering “what next” – or booking in for the next higher level degree because they can’t find a job. I don’t think James will be diverted from his chosen route by one nay-sayer. He has proof in his bank balance and lack of debt that he’s on the right route! People will defend what they are led to believe. People who are too close minded to look at things differently aren’t the type of people I want to connect with anyway because they’ll never make it when it comes to entrepreneurship. Appreciate your comment. Talk soon! Hi Joy and thank you for reviewing Jame’s book. Now this is so exciting to me because I do agree with Jame’s outlook. It makes perfect sense to me. Maybe I’m bias, but I chose not to go to college right off, because it just didn’t make any sense to me. At 17 I got a job on Wall St. I felt like I was in prison because I was only allowed one hour a day for lunch and two days a week for myself. No way was this going to work. So, back in the day… I was interested in antiques and started to buy and sell them with some friends on the weekends. So the day job didn’t last long at all. That was the start of me being an entrepreneur. By the time I was in my early 20’s I helped my partner in his business….wow how exciting. I could write a long list of things I did to make money before the internet, but why go on? I like to zoom up to today’s world. We have technology that can reach a global market. We can take just about anything and make it a business. Not easy, but once one is dedicated it can be done. As a parent I told my daughter and step kids not to go to college unless they wanted to learn a craft. The only one out of 4 kids was my step-daughter who, in middle school knew she wanted to be a package designer. She went to college and was hired on the spot when she graduated. The others: HA They partied and what they all went to college for they didn’t end up doing for a living. And..they all have student loans. I wouldn’t pay a dime for their education because that would only give them a free ticket. It had to be their choice and their dime. We learn from mistakes and they did….my daughter is in heavy debt right now, but finally leaned to be an entrepreneur. She now does freelance work. Hey, we all learn our path at different points of our lives. I know James and have the highest respect for him and all he does. I’m going over right now to buy his book. James has a good insight, especially for younger people that there is a way to earn income without working for “the man” There is a choice and hope out there for the future, especially for younger people to make that decision. I could go into a rant right now about college being a business, but I digress. Thank you James for putting together this book. Although I didn’t read it YET, I’m going over to purchase it. You are needed to enlighten people to make clear cut decisions. Thanks for sharing your career and experiences in such detail and proving yet again that entrepreneurs can be successful in life and business without the need to saddle themselves with student debt. I’ve read in more detail on your blog many of the things you did – a truly fascinating story! I helped my sons to some extent but they both had some student debt, and I really wish I had discouraged them – although Russ has paid his off. They are both entrepreneurs now, neither of them directly doing what they studied. Interesting that your daughter is now freelance too. It’s best to learn these lessons ourselves, although painful. She had great examples to follow with you and David! James is a great blogger and entrepreneur – and a real nice guy too. He’s been so helpful to me, and to others I know. He works hard and deserves all the success I see him getting. Thanks for purchasing the book, Donna, I’m sure you’ll enjoy it – I know I did. Found myself nodding in agreement over and over again. Like you said, we all learn our path at different points which is exactly why I want this book in the hands of as many people as possible. Some people are born to be entrepreneurs but end up realizing it later in their life, after they’ve already taken on debt and went through college. I was very fortunate to realize entrepreneurship was best for me at a young age, because I know I otherwise would’ve ended up racking up a ton of debt before making that decision. I was trained all my life by my parents as well as my school teachers to become an employee, but I am so thankful that I was able to realize that sort of lifestyle didn’t appeal to me before I took on debt. We have shown that there are alternatives available and I think everyone should at least be exposed to these alternative options rather than being forced into the ‘one-size-fits-all’ system society tries to throw at us. Unfortunately, many people think graduating from college is the only way to achieve success when it reality it can cause more harm than good. I think you’re right not to give your children a free ride. I do like to talk about the future and my family has asked me what I think I’ll end up doing with my money when I die. I told them that I wasn’t sure, and it would probably end up going to a selection of various charities. When they asked if I’d give any to my children, I told them absolutely not. Nobody deserves to live off of my hard work just because they’re related to me. When I have children (and I sure I will sometime in the future) I won’t give them any money. I will teach them how to make money and be their greatest mentor, but they will not get anything from me just from being my children. What does that teach them? Anyway I appreciate you sharing your story here as well as purchasing my book, I’m glad to hear that you’ve enjoyed it! What a wonderful review it is. It is forcing me to read the whole book. Thanks for describing each section clearly. Good one James! This book is very good choice for upcoming young entrepreneurs. I have some young relatives currently. I would share this post with them. Thanks for your kind words. I’m glad you enjoyed the review and will be recommending the book to your relatives. You will be doing them a great service if you can save them being burdened by student debt, and offer them a credible alternative, such as James has shown possible. Appreciate your comment. Joy did a great job on this review and I am so thankful for all of her hard work on it. I agree that this book would be a great read for some of your relatives. Student debt can be a life ruiner if you don’t know what you’re doing and that’s something we all want to avoid. Oh my… Looks like I walked in in the middle of a debate. The other side would have been more convincing he’d used a name and a face rather than some pseudonym. I do have mixed feelings about going straight into business as a choice rather than other routes. Yes, it’s about life experience – and you don’t need to go to Uni to get that. Don’t get me wrong, for those like James with knowledge, ability to learn and think on their feet and the work ethic – to go for it. As a late comer to self-employment I know I wouldn’t have it any other way now. I do feel that the experience of a job (or several in my case and working up to management level) gave me insights I would never have. I remember many years back in the first company I worked for, I did day release and night school to gain my qualifications. In summer we had uni students working – and the DREAD involved. They were educated, they had brains enough to learn and yet NO common sense, no practical real working skills. I think what I am trying to say is whether you are self-employed or at Uni you do tend to be in a bubble doing what needs to be done at that point in time. Stepping outside of the bubble from time to time gives experiences that enhance and compliment current skills and knowledge. My daughter went to Uni and has not secured a job in her chosen field – yes and now saddled with £1,000’s debt. She did some time freelancing online but has decided it’s not for her and got a job in sales. They are training her on the job – I doubt she’ll stay there. It’s a stepping stone and hands on real world skills training that she never had in Uni and will likely be more useful than a degree. Great review Joy – you made me chuckle with your comment about marriage and children! James – good luck with your book. You know you’ve struck a chord when people disagree so vehemently! My parents felt that getting a job first was the right thing for me to do before being self-employed – and actually I think they were probably right for me. Although I had the work ethic for self-employment I didn’t have the self-confidence. They wanted me to go to uni, but I couldn’t wait to get out into the world and start earning – so I did. I certainly wouldn’t have wanted to take on debt AS WELL as delay earning, by going to uni. Of course, in those days, I certainly wouldn’t have incurred the levels of debt that today’s students face. In my first job, as a computer programmer, I worked alongside a graduate. Most of us – all doing the same job – were not graduates and the non-graduates did the same job just as well, probably applying more common-sense from their life experience. The graduate (quite rightly) reported to a more experienced non-graduate. Even more fun – we were all (shock horror) female, and HE was a male! I later studied for my degree part-time, for my own interest and although I thoroughly enjoyed the course, it didn’t make me a better computer programmer! James is indeed an exceptional young man to be able to go straight into self-employment and prosper in such a tough market-place, others may benefit from pursuing employment alongside self-employment – but it’s important that they consider all viable alternatives to taking on debt. Thanks for your thoughts and experiences. Yeah, I don’t think there are too many people who can go straight from unemployment to successful business owner right away haha. In the book I do tell people to work a regular job while building up their business and not to quit their job until they’re making more than enough to live off of. Of course, if you take on debt your monthly expenses go up so you have to wait even longer to quit your regular job and work more on your business. Admittedly I haven’t worked a lot of traditional jobs because I was already successful with my business ventures by the time I hit 18, but I did work long enough to realize that it wasn’t for me. I don’t like that sort of control over me, being told when and how to do things. I know some people are better suited for that sort of thing but I don’t think entrepreneurs are those types of people lol. The world is changing fast and won’t be the same even just 10 years from now, but I think when making life decisions you’ve got to look out for the long-term. If your long-term goal is to work for yourself, than there isn’t really much point in taking on debt to gain credentials you’re not going to use right? Appreciate your valuable addition to this post Jan! Wow what I a wonderful book review, I will be recommending it my nephew he starts college in this year, thank you. Glad you like it – hope you’ll send it to your nephew to read before he decides whether to take on the student debt or not. Appreciate your comment here on Joy’s site. I agree with her, it may be a good idea to send it to him before he starts. I’m not saying he should avoid college but after the reading the book he may decide it’s not the best option for him. Even if he does go, this book will provide him a bit better idea on what to major in to actually secure a job after graduation. I’m so happy that when I attended school I was able to do it without taking on debt (of course it was before the recession) but still. I just couldn’t see starting my career with such a weight on my shoulders. It’s already hard enough to figure out how to provide for yourself, who wants to add that into the mix. I’m sure you’re right about the average parent’s view on the book’s advice but in these changing times you have to be more open minded. The traditional stuff may not work in all situations anymore. Previous times were simpler. I mean look at all the very successful entrepreneurs who dropped out of college to start businesses or never attended. Not the worst idea in the world if you’re driven. Wow, your kids made out pretty good. That’s goes to show you can change course and still end up happy. I feel very sorry for the young people who really want to study serious subjects that WILL lead to employment (if that’s what they want) and they can only do it by taking on such debt. The ones who are at uni just for fun and partying SHOULD be the ones who would be deterred by the thought of the debt, but don’t seem to be. You make a very good point about so many successful entrepreneurs who never went near a college. I hope that many parents will read this book too, with an open-mind, and that it will help the debate that must occur in many families. I wasn’t sure my kids were making the right choice at the time, but they stuck to what they wanted, and all credit to them. I’m very proud of both of them. Glad to hear you were able to graduate without a mountain of debt. Some people are taking on so much that the interest rates alone are swallowing them alive and they can barely knock down the principal because of it. The fact that there are now 30 year student loan repayment plans is astonishing to me… could you imagine still carrying student loan debt at the age of 50? 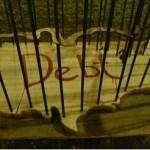 The debt can definitely be worth taking on for some people, but the problem is that many people who take on debt today are majoring in areas that grant them no additional employability. Getting by on minimum wage with student loan debt is a lot harder than getting by on minimum wage without debt. At such an early age these people have dug themselves a hole that’s extremely hard to get out of, and it’s a real shame. Great review. I cannot fathom why people are getting into such severe debt at the start of their working lives, especially those in fields that will make it next to impossible to get out of that debt. When i was i college, I took a part time sales job, and fell in love with it. I dropped out of college to pursue it. I have never looked back. I have worked for myself most of my life and have no regrets. Sure, if someone wants a job working for others all their lives, then there may be some arguments as to getting into debt to position oneself or the job market. For entrepreneurs, it makes very little sense to me. I’ll definitely have to grab a copy of this one! Thanks! Glad you enjoyed the review and agree. You seem to have gone the same route as James – started college then pursued the entrepreneurial route, and happy with it. For some high-paid professions, where there’s a high percentage chance of well-paid employment, I guess you could see the debt as an investment – like a mortgage on a house in a rising market, but otherwise???? Let’s hope this book helps young people at least make informed decisions, rather than just blindly taking on debt without considering any alternatives. I hope you’ll enjoy reading the book and will pass the message onto others. Hi Joy,another great insightful article. Really fair and in-depth review, Both my Son and Daughter are at Uni at the moment with my daughter starting straight after her A-levels and my Son after working and traveling, both have part time jobs subsidized by the bank of Mum and Dad, They are enjoying life and I am enjoying watching them do it. I know all about the bank of Mum and Dad! So glad that your family has found solutions that are working for everyone. That’s the most important thing of all. With a balanced attitude and your support I’m sure they’ll do well and make the best possible choices. What a brilliant review this is. It is compelling me to peruse the entire book. Much obliged for depicting every segment obviously. Great one James! This book is great decision-making tool for future youthful ambitious people. I have some young relatives as of now. I would impart this post to them. I’m pleased you enjoyed the review. Thanks for sending this post onto your young relatives – whatever decision they eventually make about college and student debt, it’s important that they take it from an informed position, having read James’s book. The $9.99 price is small to pay, compared to the price of ending up with unjustified student debt. Wow, just came across this book. Very eye-opening. I’m going to force my children and their children to read it. It will be money well spent! I hope you and your family enjoy it.